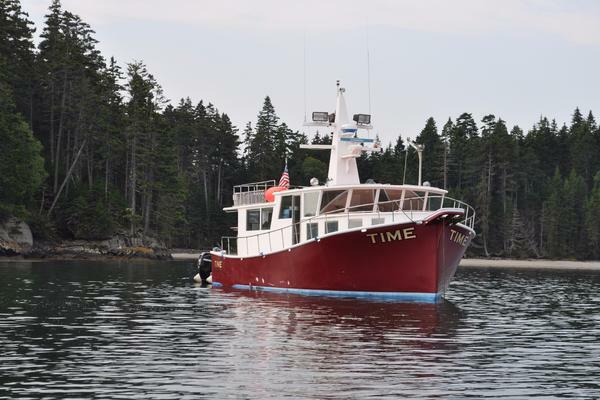 Knot So Fast is an immaculately kept Sundeck trawler with a reliable Lehman engine with bow thruster, Kohler 8 KW generator, and lots of updates. A roomy aft cabin cruising yacht on a semi-displacement hull, she cruises at 7-8 knots and sips approximately 1 ½ gallons per hour. She has a stable ride with hard chines and a long prop-protecting keel. With the easily lowered arch, the bridge clearance can get down to approximately 15 1/2 feet, making it a great Great Loop boat. Sporting a huge aft stateroom with true size queen bed, vanity dresser, and loads of built in storage, she has a large master head with a tub. Her guest cabin has an offset double and ensuite settee. Knot So Fast has a rich teak interior, which is air conditioned and accented by a lower helm, wrap around settee that can convert into a bed, overhead handrails, and a fully equipped, spacious galley with serving bar. The full-width sundeck is among the largest you'll see on a 40' yacht, fully shaded by a hardtop and protected by sturdy teak handrails. And the flybridge has captain?s and co-captain's chairs plus guest seating that can double as a watch berth. The seller's personal belongings, tools not proprietary to the vessel, sewing machine, and kayak are not included in the sale.